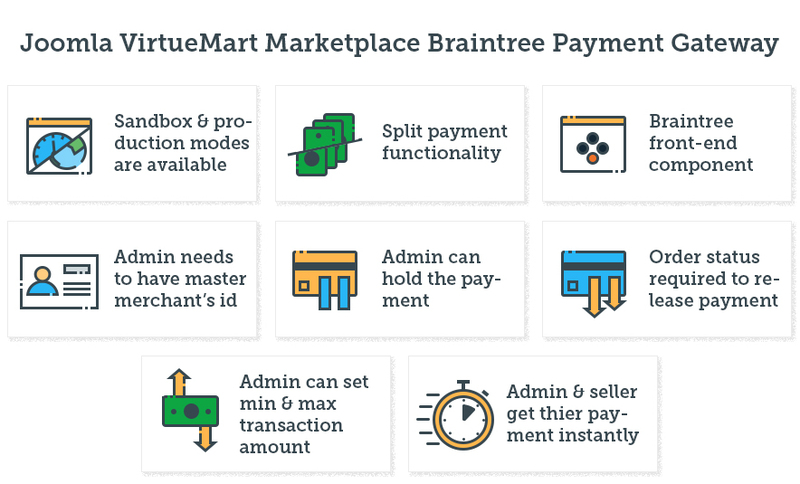 Joomla VirtueMart Marketplace Braintree Payment Gateway : Joomla VirtueMart Marketplace Braintree Payment Gateway is a remarkable add-on. This Payment gateway consist of split payment functionality thus sellers of your marketplace get their funds very easily. Now buyers will not be redirected to any other site while making their payment. In addition to this admin can hold and release the fund of seller with respect to a particular order. Joomla VirtueMart Marketplace Braintree Payment Gateway: Joomla VirtueMart Marketplace Braintree Payment Gateway is a remarkable add-on. This Payment gateway consist of split payment functionality thus sellers of your marketplace get their funds very easily. Now buyers will not be redirected to any other site while making their payment. In addition to this admin can hold and release the fund of a seller with respect to a particular order. Both the payment modes sandbox and production are available. Provides split payment functionality for Marketplace seller products. Braintree front-end component view is provided, i.e there would be "Braintree Registration" tab in the main menu so that sellers can provide their specific funding details for Braintree Marketplace payment gateway. Admin needs to provide Master merchant's id from his Braintree merchant account, which will be treated as administrator. Payment funds can be hold by the admin of the marketplace through the "Hold in Escrow" option provided in payment plug-in. For Releasing the funds from Escrow Admin need to provide an Order Status from payment plug-ins configuration, which will be used to release funds. For using this payment gateway by the customers Minimum and Maximum transaction amount can be set by the admin. Did you buy Joomla VirtueMart Marketplace Braintree Payment Gateway? How will the Marketplace Sellers link themselves with Braintree through your plugin? We have provided a view on front-end for collecting the details of Marketplace sellers and linking them to Braintree. I have installed Braintree marketplace on my website, but I don't know how the view for Marketplace Seller registration for Braintree will show? After Installing the Braintree Marketplace, you need to create a view by selecting a view under Braintree marketplace component. What are the supported currencies of Braintree Marketplace? Braintree basically supports the only USD for its Marketplace transactions. Does the admin have an option for holding the funds in his account until he gets confirmation from the Marketplace Sellers? Yes, we have provided an option named " hold in escrow " by which admin can hold all the funds on his side and later on can transfer to the Marketplace Seller. Funds held once at admin end will be transferred to the marketplace Seller in which way? We have provided options in the plugin configuration to set the Order status for releasing the funds, whenever admin will set this particular Order status for an Order the funds will be transferred to the Marketplace Seller.